It is often said a society is measured by how it treats its most vulnerable citizens. With that in mind, our government is continuing to take action to better meet the needs of people with intellectual disabilities. Starting April 1, 2012, we are changing the way we fund day programs from the old cost-per-space model developed in the 1970s to one that is based on the actual needs of each individual. This will also allow us to devote more resources to support people that have more complex needs. Implementation will cost approximately $6.3 million in 2012-13 which includes $4.6 million for regular day programs and $1.7 million for day programs with clients that have complex needs. The total annualized cost of the new standard will be up to $7 million when all complex needs designations are complete in 2013-14. A further $560,000 will be used to expand funding standards in current and new residential programs that support individuals with complex needs and increase to $2 million by 2014. Through these and other programs, we are working to ensure that Saskatchewan is the best place to live in Canada for people with intellectual disabilities. 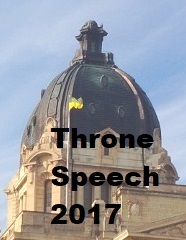 Congratulations to Vaughn C. Schofield in her appointment as Saskatchewan’s 21st Lieutenant Governor. Ms. Schofield’s appointment was announced by the Prime Minister on March 6. She has an extensive record of community service as a member of the Canadian Forces Liaison Council, St. John Ambulance (Saskatchewan), The Hospitals of Regina Foundation, the MacKenzie Art Gallery, The Duke of Edinburgh's Award Program, Regina and Regina Beach Chamber of Commerce. Ms. Schofield is also the Honorary Lieutenant-Colonel of 16 Saskatchewan Service Battalion, where she provides leadership and support to the unit and to the Canadian Forces Reserve, in particular to those who have returned from Afghanistan. I would also like to thank outgoing Lieutenant Governor Gordon Barhardt. Dr. Barnhardt served our province well as the Queen’s representative over the last four years. The date for the installment of the new Lieutenant Governor has yet to be announced. Saskatchewan’s farm and ranch families continue to make valuable contributions to our province. As a government, we are continually looking for ways to improve programs and services to address the needs of producers. The Saskatchewan Crop Insurance Corporation has launched AgConnect, a new web-based application which allows AgriStability customers to submit and manage their program information online. This process will help reduce the timelines for processing applications, therefore improving service for customers. Through AgConnect, you can download and submit program forms and supporting documentation. AgriStability participants will receive an AgConnect activation letter by the middle of March. For more information on AgConnect or AgriStability, producers can contact their local SCIC office, call 1-866-270-8450 or visit the SCIC website. While our government remains committed to essential services legislation that keeps you and your family safe, we take issue with part of the recent Court of Queen’s Bench ruling that found certain part of the legislation unconstitutional. In his ruling, the judge found that the right to strike is constitutionally protected, which breaks new Canadian legal ground. If upheld, it will have much broader implications for the entire country. It is also important to remember that the court upheld the principle of essential services and The Saskatchewan Federation of Labour has indicated they are willing to discuss this issue and we hope to work with them as we amend the legislation.